A tasty savoury bake that serves 4. Garnish with tomato wedges and parsley sprigs. Cook the onion in ½ oz (14 g) of the butter until just soft. 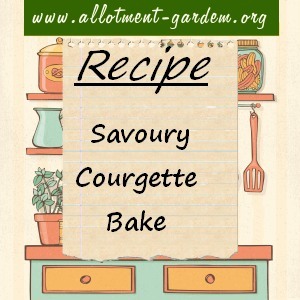 Place half of the courgettes into a 3 pint (1.75 litre) oven-proof dish, cover with half the onion and the tomatoes. Sprinkle with the mixed herbs and seasoning, then top with the remaining onion and courgettes. Make a sauce by melting the remaining butter in a pan, stir in the flour and gradually add the milk, stirring continuously until the sauce thickens and boils. Season with salt and pepper and add 3 oz (84 g) of the grated cheese. Pour the sauce over the vegetables. Mix together the remaining cheese and the breadcrumbs, sprinkle over the sauce. Cook uncovered in a pre-heated oven at Gas Mark 4/180°C/350°F for 35 to 40 minutes until golden brown. Garnish with tomato wedges and parsley sprigs. This was delicious. We love any vegetable in cheese sauce recipes. Have had to make this several times this summer.